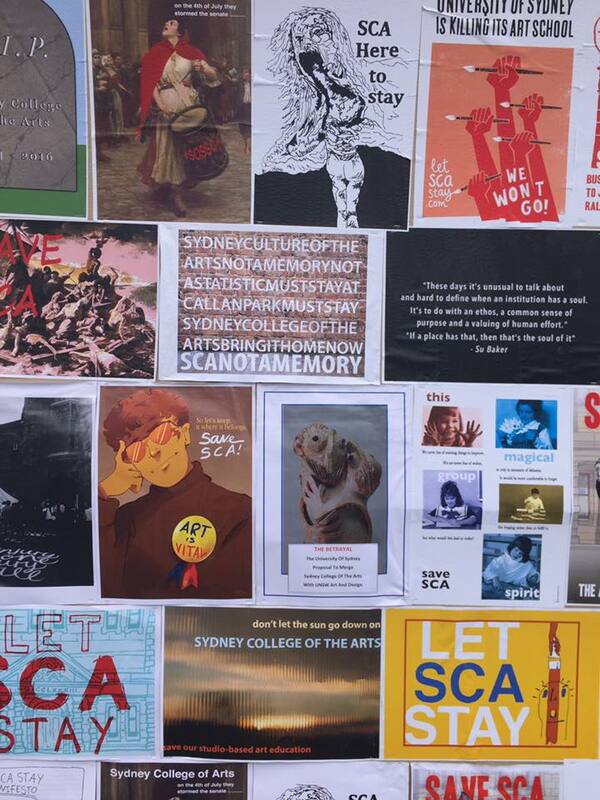 PRESSURE OF LET SCA STAY TRIGGERS CENSORSHIP AT SYDNEY UNIVERSITY. Two student-led peaceful direct actions have been met with a stern show of force from the university over the weekend. The university is showing signs of vulnerability and anxiety when pressured by student campaigners by forcefully removing peaceful occupiers from the public campus in Camperdown followed by removing and deliberately destroying an official exhibit apart of a Student Union ‘Festival of Creativity’. 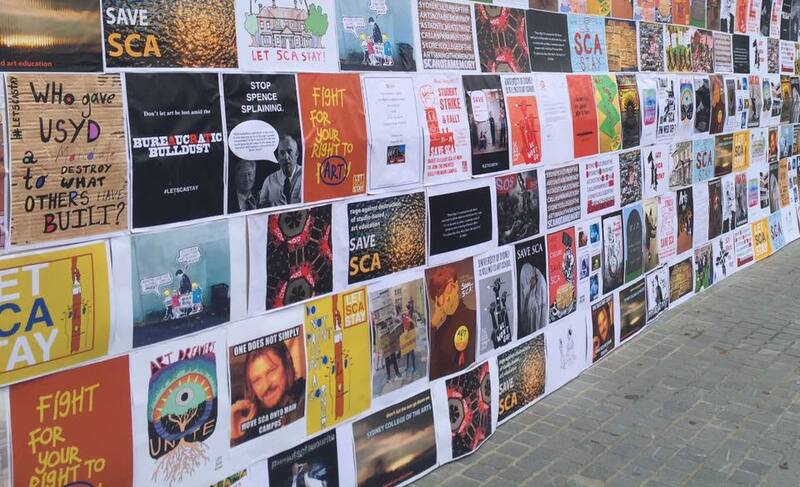 Campus security have removed and deliberately destroyed a poster exhibition featuring works created in support of SCA. The exhibition was an official part of the University of Sydney Union’s ‘Verge Festival’ and was authorised to utilise space in Hermann’s Bar to exhibit the works. The exhibition organisers were not consulted or made aware of the university’s intention to remove the material and were given no chance to negotiate with university administration or to retain the material for exhibition elsewhere. 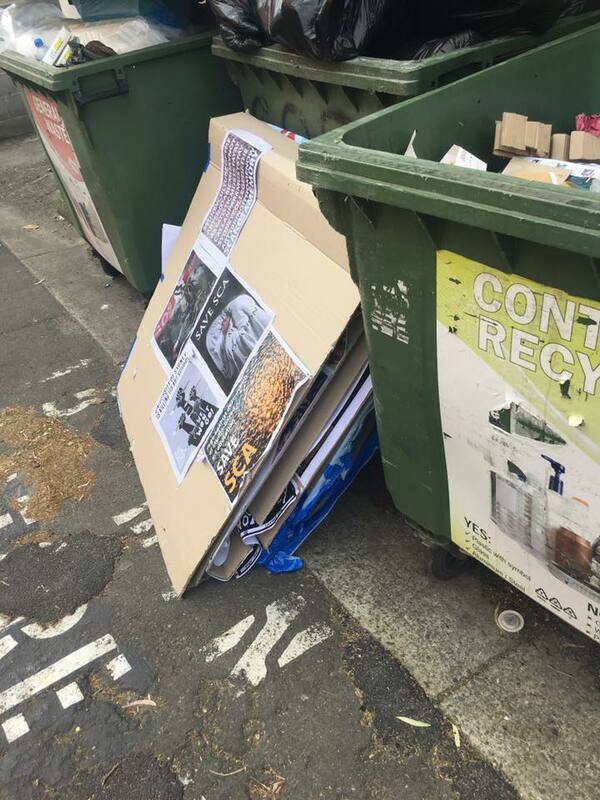 The material was later found disposed of in a general waste bin with obvious evidence that the posters had been deliberately removed from their backing and intentionally torn up. The campaign holds this blatant censorship of ideas that criticise the university as highly anti-intellectual and against the values of the intellectual community at large. The campaign is investigating possible legal avenues and the possibility that the university may be in breach of its own administrative policies as well as implied freedoms of political communication in the constitution. On Thursday October 6 numerous Sydney College of the Arts and University of Sydney students walked out of class to attend a rally on the university’s Camperdown campus. The direct action involved a march to the university’s main Quadrangle to unveil a large banner endowed with dollar signs saying ‘U$$$$$$$ […] YD IS KILLING ITS ART SCHOOL’. The action coincided with a graduation ceremony nearby with many graduates taking photographs with the banner in the background. Following the action, the students set up tents on the lawns of the main quad and initiated an occupation in solidarity with the occupation in the SCA administration building which is coming into its 50th day. In the early hours of Friday October 7, occupiers on main campus were forcibly removed by campus security, and Riot and Public Order police the occupation of the administration building is ongoing. Bachelor of Visual Arts student, Hamish Dobinson says “It seems that the campaign has been very effective at putting pressure on the university and it is now buckling even further. The campaign has already been very successful at dismantling USyd’s original merger plans and now the university is chasing its tail trying to cover up its motivation and mismanagement thereof, all while pushing even more for the unjustified closure of the Rozelle Campus by talking down the achievements of the college. These petty acts of intimidation I saw over the weekend are not only questionable ethically but are totally transparent and ineffective. I’ve seen constant backpedalling from the university over the last few months and can’t seem to understand how or why they would get themselves into a situation like this”. “The Ex-Rozelle Hospital is an example of one of only three Kirkbride style complexes still in use in the world and should be a symbol of prestige to the university. If SCA leaves Callan Park that could also possibly be the first cog in the commercialisation and development of the park, which is terrifying to me. We’ve got enough of that going on already” Mr Dobinson said. The campaign regards this show of force as overzealous and anxious censorship of campaign opposing the planned move and cuts of Sydney College of the Arts. The show of force also coincides with the first case of a legal campaign representing over 100 students being heard by the NSW Civil and Administrative Tribunal on Wednesday October 6 and the release of documents showing questionable conduct by the university, including the re-appropriation of $45 million in state government funding for the arts to other purposes and the true effects of the university’s highly contentious ‘space tax’ also known as the University Economic Model (UEM). The poster exhibition that was ripped down by campus security last night. Also is it correct that anyone who interferes with an art work -of which this wall is and has many- is liable to be sued for altering or defacing artwork?